Abstract: Cerebral cavernous angioma or cavernoma is a benign vascular malformation, usually asymptomatic. It is infrequent and often its discovery is incidental, a so-called incidentaloma. However, these lesions can be symptomatic, causing headaches, epilepsy, cerebral hemorrhage and other neurological signs depending on the brain area involved. 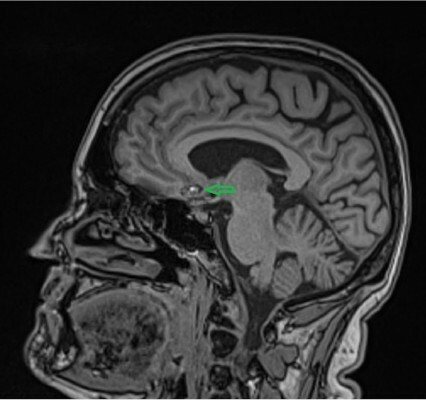 Frontal localization is responsible for psychiatric disorders, particularly the prefrontal region, leading to prefrontal syndrome, a condition common in all frontal lobe tumors. Psychopathological syndrome can be depression-type, pseudodepression syndrome or maniac-type, pseudomaniac syndrome. Surgical treatment of lesions like this may not always be possible due to their location in eloquent areas. In this study, we describe an unusual association of migraine-like headache, epilepsy and frontal lobe pseudodepression late-onset syndrome in the same patient. We have considered this case interesting mainly for the rarity of both a headache with migraine features and for the late onset of pseudodepression syndrome. Pathophysiology underlying migraine-like headache and that concerning the late-onset pseudodepression frontal lobe syndrome seems to be unclear. This case leads to further hypotheses about the mechanisms responsible for headache syndromes and psychopathological disorders, in the specific case when caused by a cerebral frontal lobe lesion.